BMW has redefined the roadster which will be revealed under the Californian sun. On 23 August 2018, the Pebble Beach Golf Links near Monterey, the well-known venue of the Concours d'Elegance being held there a little later, will become the setting for the world premiere of the new BMW Z4. With dynamic proportions, emotional design and fascinating sportiness, the open-top two-seater will take the classic roadster concept into the world of today and tomorrow. In Pebble Beach, the Munich-based premium carmaker will present the exclusive BMW Z4 M40i First Edition. The limited special edition of the roadster inspires not only with the agility, precision and dynamic handling characteristics that are so typical of BMW M Performance models, but also with particularly sophisticated design and equipment features, including a body paintwork in Frozen Orange metallic. The new edition of the roadster will celebrate its world premiere at precisely the same location that served as the stage for the first public presentation of the BMW Concept Z4 last year. With its puristic, dynamic and progressive design language, the concept vehicle presented a vision of a charismatic sports car which, thanks to the production model, now becomes reality. Just a glance at the new BMW Z4's proportions leaves no doubt about its dynamic potential. The central sitting position for the driver, the low centre of gravity, perfectly balanced 50 : 50 axle load distribution, wide tracks and a compact wheelbase form the ideal prerequisites for inspiringly agile handling and intense driving pleasure. Moreover, for a perfect start into a new roadster era, the new BMW Z4 M40i First Edition offers specific design and equipment features that add exclusive accents to the car's sporty flair. The expressive body paintwork in Frozen Orange metallic is combined with an electrically operated textile soft top in anthracite with silver effect, the BMW Individual High Gloss Shadow Line, black exterior mirror caps and 19-inch light alloy wheels boasting a bicolour, double spoke design. The interior of the edition model comprises the Vernasca black leather trim with decorative stitching, electrically adjustable seats with memory function, the option ambient light and the Harman Kardon Surround Sound System. Adaptive LED headlights with matrix function for the high beam, BMW Head-Up Display featured for the first time in a roadster and the BMW Live Cockpit Professional offering the latest networking technology underpin the advanced status the tradition-steeped concept of a two-seater, open-top sports car has reached with the new BMW Z4. 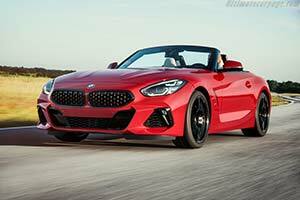 The world premiere of the BMW Z4 M40i First Edition in Pebble Beach offers a both exclusive and fascinating foretaste of the forthcoming on-road debut of the new roadster generation. BMW will announce all details of further engine variants, technical innovations and the diverse equipment features of the two-seater on 19 September 2018. This will be followed a short time later by the trade fair premiere of the new BMW Z4 at the Mondial de l'Automobile (4 - 14 October 2018) in Paris. The worldwide market launch will commence in the spring of 2019.